Fox served as the Federation’s general counsel from 1999 to 2012, when she retired. She returned to the Federation in January 2016 and was appointed the chief legal officer in April 2016. Prior to joining the Federation, Fox worked for Kaiser Foundation Health Plan, Inc., where she started in 1994 as chief counsel for Medical Legal in the Northern California Region and eventually was promoted to vice president and assistant general counsel. She began her career as an attorney with Pillsbury Madison & Sutro and was elected to partnership in 1984. She spent 17 years as a litigator representing such clients as IBM and Medtronic. Fox received an undergraduate degree in International Relations in 1973 from Denison University in Ohio and a law degree in 1977 from the University of San Francisco, School of Law. 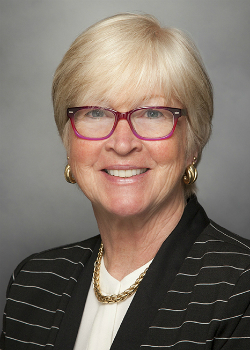 She has received numerous awards and honors including the Award of Merit from the U.S. District Court for the Northern District of California, the Bar Association of San Francisco Award of Merit for Singular Contribution to the Public and Legal Community, and the Judge Harold Haley Award for Distinction in Scholarship and Character. Fox has also served on the Board of Directors of the Edgewood Children’s Center and the San Francisco Neighborhood Legal Assistance Foundation, and as a member of the Public Review Committee for Support Services for the Elderly.